Massive march against the War in Vietnam, Austin, Texas, May 8, 1970. 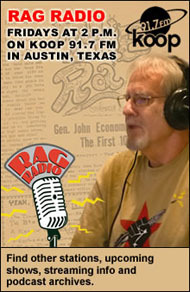 Image from The Rag Blog. Inspired by the early 1960s Civil Rights Movement protests of groups like the Congress of Racial Equality [CORE], the Southern Christian Leadership Council [SCLC], and the Student Nonviolent Coordinating Committee [SNCC], and in response to the 1965 escalation of the Pentagon’s War in Viet Nam, an increasing number of students and non-students in Austin, Texas, became involved in New Left and countercultural groups like SDS and in underground press journalism during the 1960s. 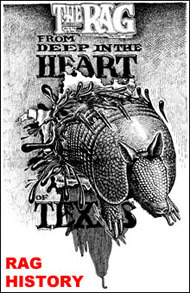 There was substantial New Left activity in other Texas cities, including Houston where underground newspaper Space City! helped pull together an active movement community, but Austin — which had always been a center for cultural and political iconoclasm — would become one of the nation’s New Left hot spots. The Students for a Democratic Society [SDS] formed a chapter in the early spring of 1964. From 1964-7, the UT chapter of SDS began to build the local white, radical student movement. Alice Embree, one of the early participants in SDS at UT, said that when she went through registration at the beginning of the Spring 1964 semester, there was an SDS information table. She conjectured that 4 or 5 people started the group. UT initiated disciplinary proceedings against 6 students involved in the anti-war protest… against Hubert Humphrey… Simultaneously the UT administration… called for the arrest of George Vizard, a non-student. Vizard was arrested by Austin police… The police brutally arrested him in the Chuckwagon, a café and radical hangout in the Student Union… Over 250 outraged students and faculty members… founded the University Freedom Movement [UFM]. UT campus, 1967. Photo from The Rag. 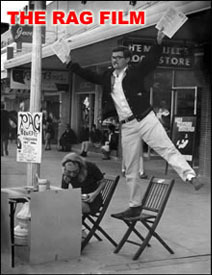 But despite subsequently well-attended free speech rallies and extralegal campus protests by UFM supporters during the rest of April 1967, the six anti-war students who were being disciplined by the UT administration were all placed on probation for their political activity on May 1, 1967. Yet the anti-war countercultural movement in Austin continued to gain more local popular support, and in October 1969, around 10,000 people protested in Austin against the Republican Nixon Administration’s failure to end the Pentagon’s War in Vietnam . 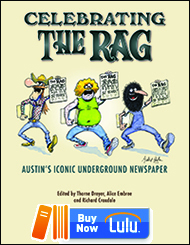 This entry was posted in Rag Bloggers and tagged Austin, Bob Feldman, Civil Rights Movement, New Left, Peace Movement, SDS, Sixties, SNCC, Student Activism, Texas History, The Rag, University Freedom Movement, UT-Austin, Vietnam War. Bookmark the permalink.